Would you like to have your products featured in a national magazine? What about features in over 200 publications and TV shows? Andreea Ayers did just that with her Tees for Change business, along with selling over 20,000 units. A move across the country, a baby on the way, and dreams of having her own business pushed Andreea to go for it and work like crazy to grow her brand. Hear her best advice on getting started, earning loads of wholesale accounts, and gaining massive PR for her business. At 5 months' pregnant with a recent move from New York City to Colorado, Andreea struggled to find a job in her chosen field of marketing. She thought about what she loved to do and the kind of business she'd be passionate about running. With a love for inspirational quotes and all things eco-friendly, Andreea settled on an inspirational, eco-friendly t-shirt line. Now a mom to three kids ages 3, 5, and 7 years old, Andreea launched her first business just one month before her first child was born. Entrepreneurship and motherhood have always gone hand in hand for Andreea! Order t-shirt samples from manufacturers to nail down style, size, and eco-friendly materials. Researched screen printers to put her designs on the t-shirts. Andreea was lucky to find a great screen printer in her home state of Colorado. Built a website so she could sell her shirts online. When Andreea started her business in 2006, it was much more difficult to find organic and eco-friendly t-shirts. Many brands were just starting to explore the industry, so they'd have only a very basic black or white t-shirt with an unsophisticated fit. Andreea did a lot of research as well as asking others in the industry, and ultimately she found several companies who could supply eco-friendly t-shirts. There wasn't a clear winner among her options, so for the first few years of year business, Andreea tried several different brands to see what sold best. After testing the market and having confidence in what her customers wanted, Andreea had her own t-shirts custom-made. Hire a pattern designer to sketch out and design the exact product you want, then bring that to your chosen factory for production. Work directly with the factory to modify an existing style. Andreea used option two. She worked with the factory where she was already buying pre-made t-shirts, and took an existing style that sold well and had it made in custom colors. Those custom colors weren't being sold to other companies or retailers, so Andreea had an advantage. Fairly quickly after launching her Tees for Change website, Andreea started reaching out to retailers to get her shirts into stores. She brainstormed all the different shops and marketplaces where her t-shirts would be a great fit. She thought about gift shops, organic stores like Whole Foods, but ultimately, she decided that yoga studios would be the perfect fit for her t-shirts. As someone who does yoga herself, Andreea knew what that target market would want, and her inspiring t-shirts with quotes and sayings would pair perfectly with that audience. Andreea focused solely on getting into yoga studios early on. Andreea spent one weekend doing nothing but researching yoga studios that she could reach out to with her product. She told us that she stopped work only to eat or nurse her son, but by the end of that weekend, she had a spreadsheet with 3,000 yoga studios, and the contact information for the owner or buyer for that studio's boutique. She got a bunch of business cards, thread, and safety pins and printed her first batch of hang tags herself. Looking back, she's a little embarrassed at the quality of that first round of hang-tags, but she was doing everything herself and learning as she went. When a studio asked for a line sheet or order form, Andreea would say, “oh yes I do have that!” and then she'd Google what that was and put it together on the spot. Within the first month of business Andreea sold out of her first run of t-shirts! Andreea invested about $1,000 initially to start with 96 different shirts. She knew that if her business didn't work, she could live with losing $1,000. She played it safe with a small first run, but when all of the yoga studios were interested, and they would ask for 10 or 15 different shirts, she was panicking because she only had 6 of each shirt! After that very first run she had enough sales to then only use her business money for the next run. Andreea continued to grow her business by never investing in more money than what she had in that business bank account. She never went into debt. At the time, her husband was in grad school, and she was the only one making money. She didn't have the luxury of taking from their own bank account. For the first two years of her business, Andreea was doing all the shipping herself or with her husband's help! She would print out her orders in the morning, put them on her desk and kindly ask her husband if he had time to pack them. Sometimes he did, and sometimes he didn't. Her t-shirt inventory lived in her son's bedroom in their tiny, 2-bedroom apartment. They had to move his crib into their room and use the nursery as a mini warehouse. Before he went to class each day, Andreea and her husband would pack up their car with tons of packages for the post office and UPS. 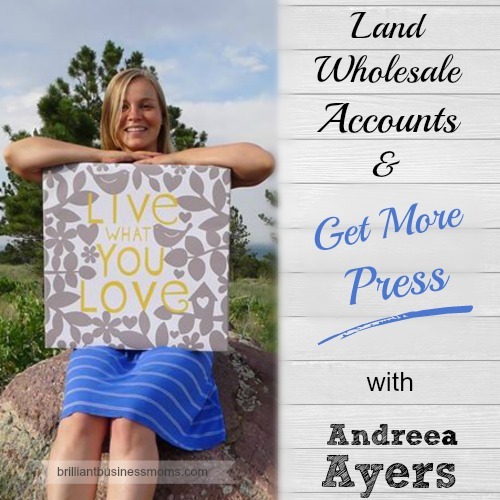 Two years into her business Andreea received a huge order from whole foods. She spent a whole week just packing and shipping t-shirts! At that point she knew her solo shipping system had to end. Andreea interviewed fulfillments houses, found one she liked, and they took over all of her packaging and shipping. No more t-shirt warehouse in the nursery! After getting featured on a blog whose theme matched perfectly with Andreea's shirts, she realized the power of publicity to grow her brand. Unfortunately, Andreea made a few left turns before figuring out how to leverage PR successfully. PR Firms. A PR firm approached Andreea to represent her brand for a 3 month period. She paid them $2,000/month for 3 months. They did get her a few features but it didn't feel like much compared to the money Andreea was spending. Relinquishing Control of your Marketing Efforts. When working with a PR firm, Andreea hated that she had no control over the marketing efforts they were making. She had no idea what stories they were pitching and to who. They would only tell her when someone said yes, and then they'd give her a name and address to send out a t-shirt. Ultimately, Andreea took back control and secured loads of great PR opportunities for her brand. Pitch for a Particular Section or Feature. You need to have a specific plan of where your product fits into that magazine. Is it perfect for a certain holiday gift guide? Does it work for a fresh finds section that happens each month? Perhaps the magazine has a small business or eco-friendly section. Andreea got very specific and researched each magazine to home in on the exact section that fit her t-shirts best. Find the Right Editor's Contact Info. Once you've settled on your goal feature, you need to figure out who's in charge of that section of the magazine. Use the masthead of magazine where every editor and staff person's name, title, and job is listed. Andreea wrote down those names or took a photo with her phone. Nail Down an Email. Andreea used a few strategies to get that particular editor's exact email address. She would research online, and once she figured out the company's email format, such as firstname.lastname@oprah.com she could use this to create the email address of her desired editor. Oftentimes, she'd try several different formats until one worked! Andreea would also call the company and simply ask. This method can take a lot of time, but it's perfect for someone on a bootstrap budget. Invest in a Media Database. If you have the funds, you can invest in a media database where you can simply type in the name of the person you're looking for and immediately find the correct email address and phone number. Everything became much easier once Andreea discovered this tool! Research what Works and what Doesn't. Andreea paid attention to what was working in terms of her wording and pitches, and then she adjusted future pitches based on which ones gave her the best response. Use Editorial Calendars for Perfect Timing. Many magazines are very specific about what products they hunt for at which times of year. The themes of a magazine tend to be the same from year-to-year, so for example, March always features Spring Fashion, April features eco-friendly products for Earth Day, and May focuses on Mother's Day. Use these seasons to your advantage. Work Well in Advance. Most of the national magazines work at least 3-6 months in advance of their publication date. For example, late June to mid-August is generally the time to submit your products for inclusion in a holiday gift guide. Some publications may look mostly in July, whereas others will stop their search by the end of June. Sometimes Andreea learned timing the hard way by hearing back from a magazine that they loved her t-shirts but closed their gift guide 3 weeks ago. Keep trying, stay ahead of the curve, and write down everything you learn about the timing of each particular magazine. When Andreea first started and focused on yoga studios, about 85% of her business came through wholesale orders and 15% came through sales on her website. As Andreea worked hard to get more press and national recognition, her business slowly shifted. By the time she sold Tees for Change 4 years later, 65% of her business was from wholesale orders, and 35% of her sales came through her website. Storytelling. Andreea learned that as a small retailer, she needed to tell her story so that her customers could relate to her. If customers can relate to you, they're more likely to trust you, like you, and ultimately, buy from you. As a very private person, it was difficult for Andreea to put herself out there in this way. Initially, she had no photos of herself on her site and said very little about who she was. But despite being scared, she took a photo of herself and her son and told the story of being inspired to start the business while in yoga class and the way that her business supports her family. Excellent photos. When you're selling online, your photos must look professional. Your customers can't touch the product or try it on, so they need to be able to see it in action or visualize how it might look on them. Initially, Andreea took all of her own photos, but when a magazine needed hi-res photos, she asked a friend to quickly snap some for her. When she saw those photos compared to her own amateur shots, she knew she couldn't look back. She hired her friend to take product photos of her entire t-shirt line. Talk about Benefits not Features. When Andreea first launched her site, she talked about how her t-shirts were made with organic cotton in the USA, and went on and on about the great features of the shirts. But ultimately, people don't buy products for the features, they buy them because of how they will make them look or feel, or how they will save them time or money. Use the word “you” versus “I”. Again, you need to put yourself in your customer's shoes. How will they feel. How are you helping them. It's not about you and your company, it's about the customer. Andreea used wording such as “You're going to love this” or “You're going to feel great in this” versus saying, “Tees for Change has the highest quality T-shirts.” Essentially, your site and product descriptions should feel like you're having a one-on-one conversation with a friend about a product you love – not like a formal door-to-door sales pitch. While the traditional business world may scoff at the idea of making a handmade business work, Andreea believes that if making and creating are what makes you happy, you should continue to do so. She shared 3 excellent tips for scaling a handmade business. Hire Help. If you can't keep up with demand, then look into hiring someone to help you. You could train someone to work part-time perhaps just a few hours per day or one day out of the week. Your products will still be handmade, and if you can keep the integrity and quality of your products high, it's absolutely ok to have a handmade business without your hands touching every single item. “When you ask for help and when you invest in other people to help you – that's when you can really scale your business,” Andreea says. Andreea first started selling her t-shirts for $28, which already seemed quite high for a t-shirt. It took her a while to be ok with that price. Still, at that price her business wasn't sustainable. She couldn't pay herself or get better photos or other things she needed, so she raised her price to $32.Once she increased her price, her sales increased too! Her customers were buying more and others valued her products more. Raising your price could be the missing link to hiring help and getting all the other tools and support you need to scale your business. One of the biggest challenges small business owners face is getting more traffic to their online stores. Then, once they get that increased traffic, they need to know how to convert that traffic into sales and customers. Andreea is sharing all of her knowledge in three online courses on Creative Live, May 4-6 2015. Grab all the details here. Andreea shared the sweetest story about how her seven year-old son is testing his entrepreneurial skills. He wants to be just like his mom! Stay in Touch with Andreea! « 7 Ways to Spring Clean Your Blog: Organize, Simplify, & Get Readers to Stay.